Are you looking for fun and adventure in aviation? Then Pilot Getaways is for you. Pilot Getaways is a bimonthly magazine dedicated to private pilot travel. Each issue brings you in-depth articles on exciting fly-in destinations, including information on the best restaurants, lodging and activities, details of flying there, and breathtaking photography. George A. Kounis, pictured at right, is the publisher of Pilot Getaways magazine. An accomplished air-to-air photographer, he shoots most of Pilot Getaways aerial photographs, including all but three Pilot Getaways covers. George plays a key role in representation of the images and technical graphics in the magazine. Having traveled to 40 of the United States and 30 foreign countries, much of it in a small aircraft, George is an avid traveler and is well versed into the needs of fellow travelers. George started his private pilot training in 1995, and his experience allows him to contribute to the final editing of articles published in Pilot Getaways magazine. He has further background in engineering, with a degree in Computer Science from UCLA. Immediately before starting the magazine, he was employed by a software development company and was involved with the launch of one of the first Internet online home banking companies. George is skilled in new technologies including computers, digital photography, and the Internet. 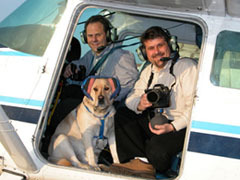 John T. Kounis, pictured above at left, is the editor of Pilot Getaways magazine and is recognized as an expert in recreational destinations for private pilots. An avid pilot, he has amassed more than 5,000 flight hours over the last 20 years, visiting more than 50 countries from Zimbabwe to Norway and Canada. Today, he continues to criss-cross the country in search of exciting destinations. In addition to flying 90% of the photo missions for Pilot Getaways, he is responsible for all magazine content and frequently gives speeches about the best fly-in destinations. Drawing on his experience in mountain flying, international operations, over-water procedures, long distance navigation, and a number of other techniques, he researches destinations and participates in resource management for the Pilot Getaways staff, including determination of feature locations and schedules. An experienced traveler, John speaks English, German, Greek, and some Russian and French; he has also had limited training in Japanese, Spanish, and Italian. Prior to entering the publishing world, John was employed by NASAs Jet Propulsion Laboratory, working on a variety of projects, most recently as lead system engineer for a component of the Cassini Spacecraft Ground Data System. The spacecraft made a successful rendezvous with Saturn in July 2004. Woody is John's yellow Labrador Retriever. He loves to fly and travels on almost all of Pilot Getaways' photo shoots. View Woody's adventures here.